Anther and stigma are two structures found in a flower. The flower is the reproductive organ of angiosperms, composing of male and female reproductive organs. Stamen is the male reproductive structure of the flower and pistil is the female reproductive structure. The stamen is composed of anther and filaments. Filament holds the anther. The pistil is composed of the stigma, style, and ovary. 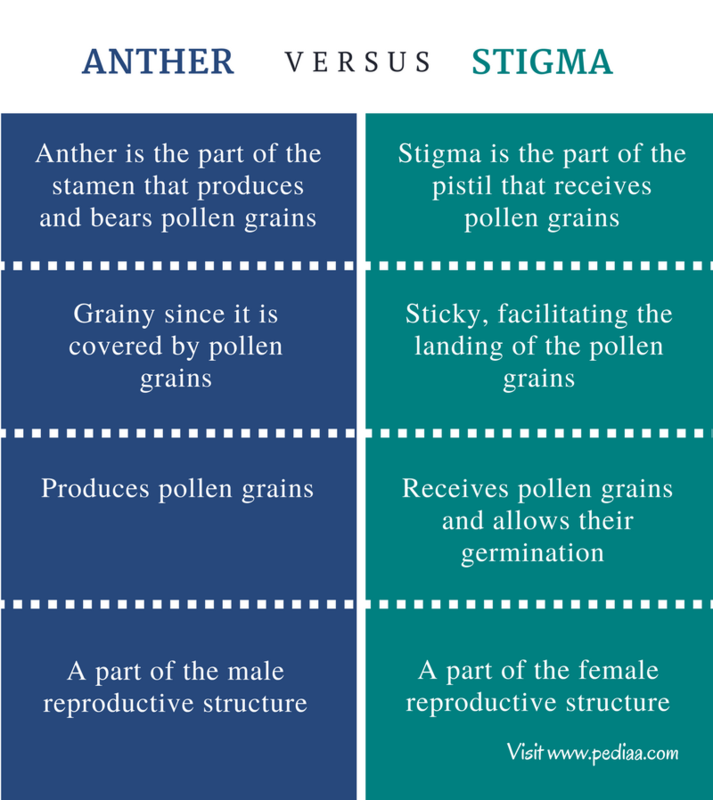 The main difference between anther and stigma is that the anther produces pollen grains and releases the pollen grains to the environment whereas stigma is the female reproductive structure on which the pollen grains land during pollination. An anther is a part of the stamen, which produces and bears pollen grains. The stamens are the individual parts of the androecium or the male reproductive part of the flower. The stamens are raised in the middle of a flower. Five to six stamens can be found in a flower as a circular ring. The anther is held by a filament. The filament is attached to the petal or thalamus of the flower. The nature of the stamen depends on the type of pollination used by the flower. Plants that use self-pollination comprise filaments that are bent towards the stigma. Some filaments keep the anthers away from the stigma of the flower to inhibit self-pollination while facilitating cross-pollination. 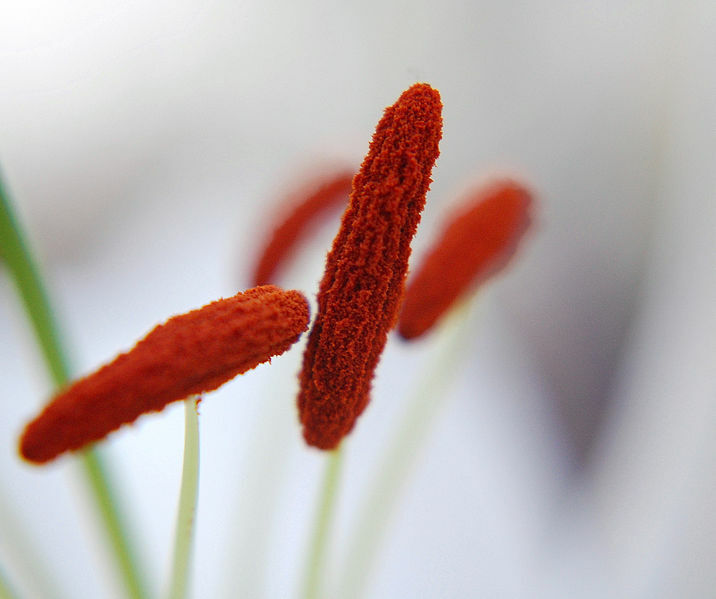 Lily stamens with white filaments and red anthers are shown in figure 01. The color of the anther varies from light yellow to deep red. A typical angiosperm anther consists of two lobes, and each lobe consists of two thecae. Each theca is referred to as the microsporangium. On that account, an anther consists of four microsporangia. A microsporangium is surrounded by four cell layers known as epidermis, endothecium, middle layers, and tapetum. Three outer layers protect the microsporangium and help in releasing pollen grains. The tapetum, which is the inner layer, develops and nourishes the pollen grains. The sporangium tissue occupies the center of the microsporangium when the anther is young. The microspores or the pollen grains are produced inside the microsporangia by mitotic cell divisions in the sporangium tissue. The microsporangia with pollen grains are called as pollen sacs. The pollen grains may vary in size, shape and surface structures depending on the type of plant which produces them. The opening of the ripened microsporangia releases pollen grains to the external environment; they are carried to a stigma with the aid of external pollination agents such as the wind, water, animals, or insects. 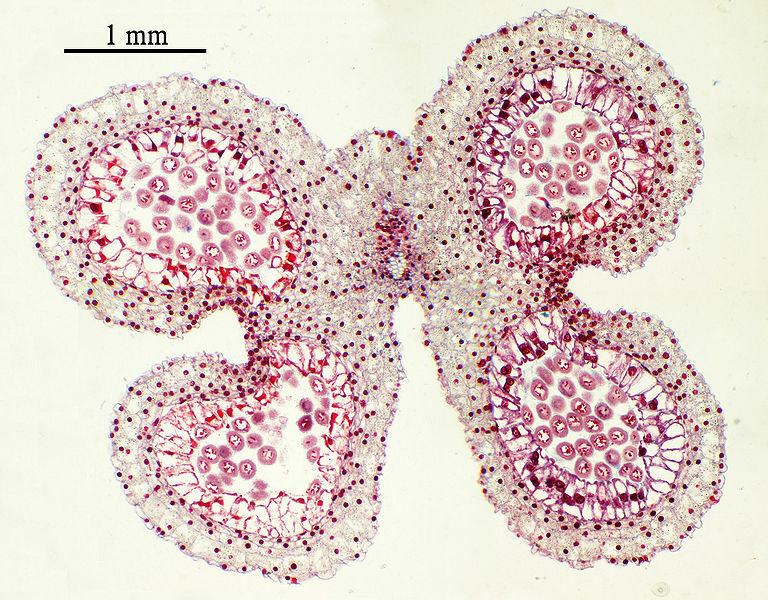 A cross section of an anther is shown in figure 02. The stigma is the part of the pistil which receives the pollen grains. The stigma, style, and ovary collectively make up the gynoecium or the female reproductive structure of the flower. The stigma is a sticky, distal portion of the style, which allows germination of pollen grains. The stigma adapts in various ways to catch and trap pollen grains. The pollen grains are received by stigma by the wind, water, insects, and animals. The sticky nature of the stigma allows the hydration of pollen grains, promoting their germination. The stigma also plays a major role in discriminating the pollen grains in the same species. Stigma and anther are two reproductive structures found in the flower of angiosperms. Both are involved in producing and receiving pollen grains. Anther: Anther is the part of the stamen that produces and bears pollen grains. Stigma: Stigma is the part of the pistil that receives pollen grains. Anther: The anther is grainy since it is covered by pollen grains. Stigma: The stigma is sticky, facilitating the landing of the pollen grains. Anther: Pollen grains are produced inside the anther. Stigma: Stigma receives pollen grains and allows the germination of pollen grains. Anther: Anther is a part of the male reproductive structure. Stigma: Stigma is a part of the female reproductive structure. Anther and stigma are two structures in a flower. The flower is the reproductive structure of angiosperms. Anther is a part of the male reproductive structure in the flower and stigma is the female reproductive structure. Pollen grains are produced inside the anther and stigma receives pollen grains by external pollination agents. The main difference between anther and stigma is their role in the sexual reproduction of plants. 1.”What Is the Function of the Anther on a Flower? | Hunker.” Hunker.com. N.p., n.d. Web. Available here. 06 July 2017. 2.”AIPMT Online Coaching for NRIs Students.” Kshitij Education India. N.p., n.d. Web. Available here. 06 July 2017. 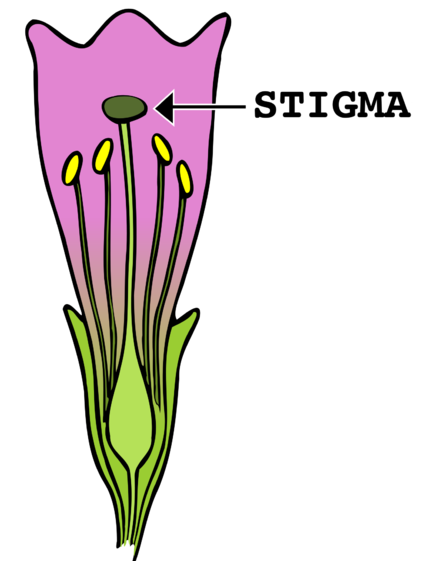 3.”Stigma (botany).” Wikipedia. Wikimedia Foundation, 02 July 2017. Web. Available here. 06 July 2017.